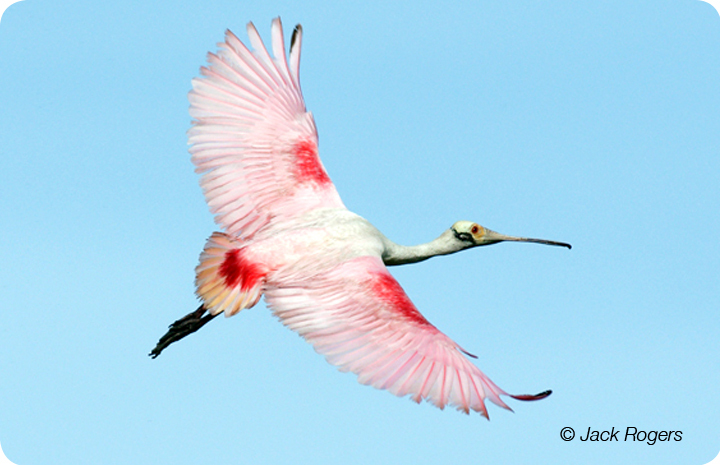 If ever a bird’s name gave away its most characteristic feature, the Roseate Spoonbill is it. “Roseate” describes its vibrant pink plumage, and “spoonbill” accurately describes the unique shape of its bill. The feather trade in the late 1800s and early 1900s took a great toll on the numbers of spoonbills in Florida, a fact appreciated by naturalists even as the commercial exploitation was going on. Spoonbills can be found near salt, brackish, and fresh water, and feed on small fish, shrimp, and other marine and aquatic invertebrates. They find their prey by feeling about with their bills in the shallow water, sweeping back and forth until they snap up a tasty morsel.